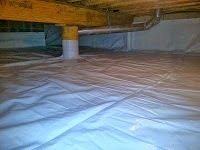 Indiana Crawlspace Waterproofing: Indianapolis Crawl Space Water Problems? Indianapolis Crawl Space Water Problems? Now is the time that many Indianapolis homeowners are forced to take notice of their crawl space. Spring time in Indiana can be great. The weather starts to get warmer and the snow is finally gone. But spring time in Indiana also brings with it heavy rains. And for those of us who live above a crawl space or basement in Indiana, heavy spring rains is not always a welcome surprise. The recent heavy amounts of rainfall that has taken place over central Indiana has had many homeowners on edge due to their crawl space or basement flooding. But it doesn't have to always be this way. Their are many steps a homeowner can take to limit the amount of water that enters their crawl space or basement. Some of the best steps to take include making sure your gutters remain clean and free of any debris. A clogged gutter system will allow water run off from your roof to dump over the gutters and right next to your homes foundation. This increases the likelihood of that water making its way into your crawl space or basement. Extending any downspouts away from your homes foundation can also go a long way in helping keep excessive water out of your crawl space and basement. But as many Indiana homeowners already know, sometimes these steps are just not enough to keep you crawl space or basement dry permanently. In those cases, an interior crawl space or basement drainage system along with a sump basin and sump pump would more than likely need to be installed. A properly installed drainage system around the inside perimeter of the crawl space or basement can give many Indiana homeowners piece of mind knowing they will maintain a dry, healthy crawl space or basement during these times of heavy rains. Additional benefits of these types of drainage systems include being able to have a usable space in your basement free of any water problems, a dryer and healthy living space above the crawl space and basement, and makes for a much easier selling process if indeed you ever decide to sale your home. At SwainCo. Crawl Space and Basement Repair we understand the headache that comes from living above a crawl space or basement in Indiana. We are central Indiana's most trusted crawl space repair contractor. Our crawl space and basement drainage systems will keep Indiana homeowners dry once and for all. If you think your crawl space or basement has a water problem or to find out more about how SwainCo. Crawl Space and Basement Repair can transform your wet crawl space or basement into a dry, healthy crawl space or basement than click here or call 317-407-1868. Really very interesting and very valuable information about the waterproofing nice work. Thanks for sharing this informative article, can you tell me about basement waterproofing cost?